A Wimps Guide to Orthognathic Surgery: 7 days till double jaw surgery! 7 days till double jaw surgery! Wow, 7 days!!! How exciting and scary and exciting again. I think the only time I'm ever going to go through a set of emotions like this again is if i ever have a baby. I can see me getting to about 8 months and freaking out about the giving birth part. Just deciding I'd like to shut my eyes and open them and then there is lovely clean baby, no pain, no stress, no worry, no pressure just a new person. I want that to happen with my operation really. shut eyes, open, wow! OMG! look I have a new face! If only it was that easy :-) As someone wise once said (I would look it up but I'm too tired) " Nothing worth having comes easily." something like that anyway, and having some jaws that work together properly is certainly worth having. "mmmmm, they look yummy. That muffin looks good, oooo a chocolate eclair..........what's that, oh that looks nice, an apple turnover...................I should just get a sandwich....................................well, actually i wont be able to eat all this soon will I.................."
So i got my sandwich, some crisps, and then i got a triple chocolate muffin, 2 chocolate eclairs, an apple turnover, an egg custard and a sausage roll and bloody well enjoyed eating them all. Granted I did go over board on the cakes and gave some to my man and ate them for pudding that night, but I haven't been able to stop. I have been on food overdrive, just thinking mmmm I fancy eating that and then eating it, its been great! 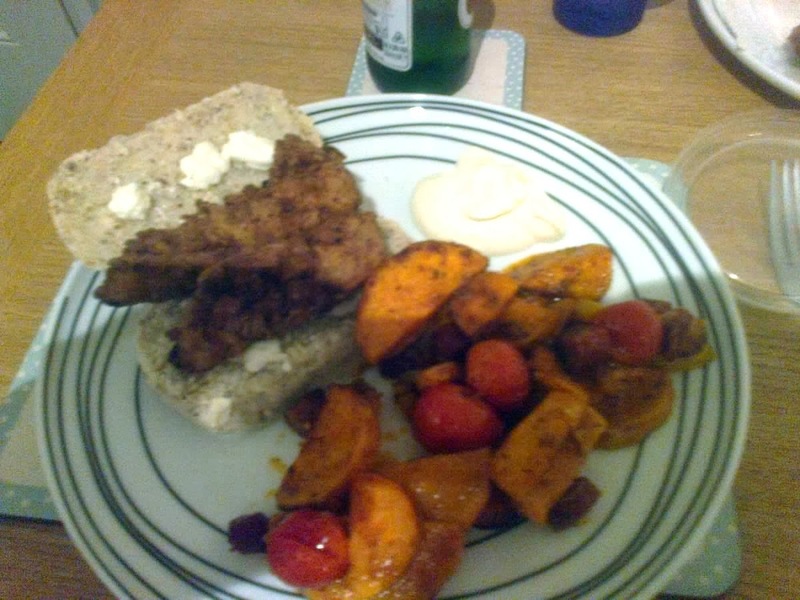 My man made fried chicken and sweet potatoes the other day, that was incredible. I've had spaghetti and meatballs, pizza, and i had 4 crumpets for my lunch today and I've eaten loads of chocolate, crisps, cakes, generally rubbish food that tastes lovely that i know in a short space of time when I'm sipping away on my 14th complan shake I will be thinking you stupid girl you should of ate that. 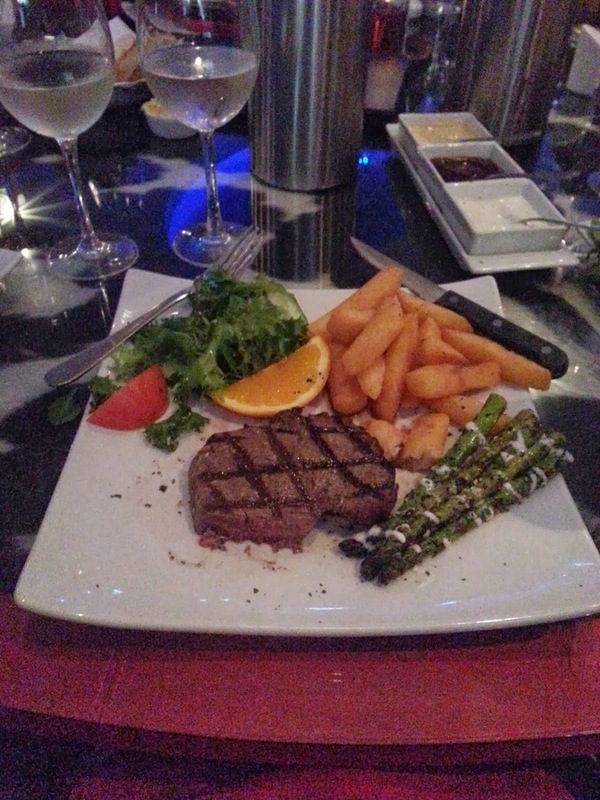 I went out for a big steak meal last Friday with friends and family, was brilliant, had great night, went out for cocktails and drinks after an danced the night away! nice little send off for my face. Some pictures of my food and my friends and my man below. I know its a cheesy kissy picture, but it does show off my soon to be different chin/jaw and I think it will be nice to do another picture like that once i'm all healed up. A good before and after. Last steak for a while!!!! Got my pre ops tomorrow, and I've got a cold. Hope that's not going to be a problem. Might be something to do with all the rubbish food I've eaten, alcohol I've been drinking and my many late nights recently? Good luck! I am also set to have double jaw surgery for an underbite. I just got my braces and will have surgery next December. I wish for you a safe surgery and a quick recovery! I'm looking forward to learning how you make it post-op. I am also a huge wimp! Eat your heart out lovely!!! I'm so excited for you Natasha. Not long to go now!!! !